Pakistan won’t get a nuclear deal. Even if it did, it wouldn’t want one. The White House is also exploring what could be a diplomatic blockbuster: possible new limits and controls on Pakistan’s nuclear weapons and delivery systems. Such an accord might eventually open a path toward a Pakistani version of the civil nuclear deal that was launched with India in 2005. Pakistan would agree to restrict its nuclear program to weapons and delivery systems that are appropriate to its actual defense needs against India’s nuclear threat. Pakistan might agree not to deploy missiles capable of reaching beyond a certain range, for example. India, on the other hand, faces no restrictions on the number of weapons it can construct. Additionally, India already possesses ICBMs that can go well beyond Pakistan or China, all the way to Europe. The U.S. nuclear deal with India only covered civilian facilities, opening them up to inspections, and allowing India to access nuclear material from the 48-nation Nuclear Suppliers Group (NSG) for civilian purposes. This, in turn, allows India to use more of its own indigenous radioactive material for weaponization. This served both the interests of India and the United States, which under the George W. Bush administration was beginning to see India as a counterforce to China. This would not be bad for the United States either, which would get little out of the deal. The American calculus for a potential deal is that by offering Pakistan such a deal, it can enhance bilateral cooperation and influence Islamabad’s behavior, especially in Afghanistan. Additionally, it would decrease the likelihood of Pakistan potentially threatening Israel or transferring a bomb to a state that would. This last possibility is unlikely, unless a radically different government takes power in Pakistan. 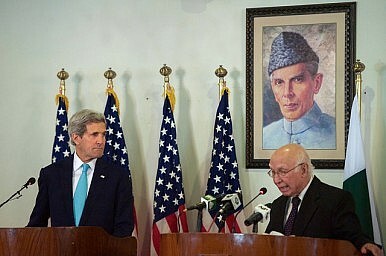 The possibility of increased cooperation between the United States and Pakistan, however, is also unlikely. Pakistan is not analogous to Iran, a country that has become somewhat more cooperative with the West through the negotiation of a nuclear deal. Unlike Iran in Iraq and Afghanistan, Pakistan’s strategic interests do not converge with the United States’ in Afghanistan. Moreover, Pakistan is already receiving military aid from the West and does not need to be enticed back into an international system that it is already a part of. There is little incentive for Islamabad to make a deal, which would constrain Pakistan while offering little in return. But even if Islamabad enters a deal, it is unlikely to cooperate fully with the West, particularly in Afghanistan. Pakistan’s security strategy depends largely on nuclear weapons, which it believes balances out the asymmetry in conventional power between itself and India, which has six to seven times as many people and a more modern industrial base. As a result, Pakistan not only has more nuclear weapons than India, but has developed tactical weapons for use on the battlefield. Due to fears of Indian encirclement, Pakistan continues to regard Afghanistan as “territorial depth” and extends support to the Taliban. This does not sound like a state that would accept the constraints an American deal would impose on it, unless it has a radical change in its assessment of its security situation. And if a deal is sealed with Pakistan, it would likely not be adhered to fully. Pakistan's civilian government and the military are working to different ends in their diplomatic efforts.